Saltford brass battery and rolling mill is a Grade II* listed Building and Scheduled Monument. Historic England’s citation states that the site is an unusual survivor of the once extensive Bristol based brass industry and the remains are unique in the United Kingdom and probably in Europe. The brass industry came to prominence in the eighteenth century and the story of the site includes: the manufacture of goods for the slave trade; the migration of skilled labour from continental Europe to the Avon valley; and the development of metallurgical techniques in Britain which were to be essential to the Industrial Revolution. This mill manufactured brass goods from 1721 to 1926 using the four water wheels to drive the machinery. 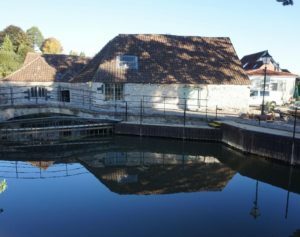 The mill, situated on the River Avon between Bristol and Bath and fed from Kelston Weir, contains five leats, three of which remain operational with functioning sluices, and one of which supports a working water-wheel. The design of the water-ways is such that there are no upstream sluices to stem flow to the mill to permit maintenance and in the past repairs would have required the river level to be lowered to the next weir, 3 miles upstream. 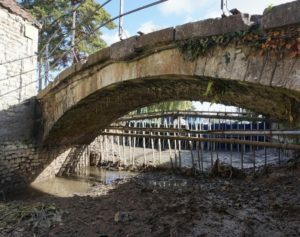 The normally flooded culverts had not been de-watered for around fifty years and one of the sluice gates was in danger of collapse. 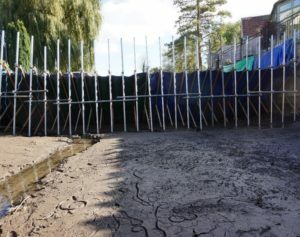 The Portadam system was used to dam the upstream leat and de-water the mill culverts enabling the project to replace the failing sluice gate with a new one constructed by the volunteers, inspect the two other gates and conduct a full survey of the normally flooded culverts. 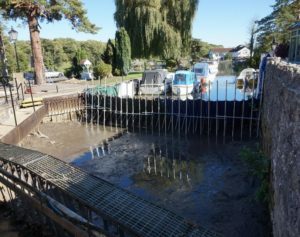 All of the brass mill project’s short-term objectives were achieved and a future programme of maintenance work will now be developed based on the survey. “The Portadam system was installed within half a day and worked without hitch for the month it was in operation. We were able to carry out all our planned work to schedule, confident in the safety and effectiveness of the Portadam system. All the OnSite staff were very friendly and efficient. We would be pleased to use the system in the future to conduct repairs and maintenance of the normally flooded culverts and sluices within the scheduled monument. We would highly recommend the Portadam system for this type of work”.